So what is the common denominator in all of these incidents, if any? It is that, in each instance, the black men involved were either resisting arrest or fleeing to avoid arrest. With that level of fear and resentment of police within the black community, it causes one to wonder whether or not we have passed the point of no return in race relations where it is no longer possible to create a color-blind society. What is undeniable is that young black men have created a stereotype for themselves… a stereotype that must be fully understood by all concerned before we can even begin to deconstruct it. So, if black people did not set out to purposely create a subculture in the freest, most prosperous nation on Earth… a subculture typified by poverty and hopelessness… then they must have had some very determined help. And we know who that was. For example, in 1866, after being defeated in the war to end slavery, Democrats established a paramilitary auxiliary called the Ku Klux Klan. The Klan’s purpose was to keep the freed slaves in line and to intimidate them into voting for Democratic candidates. Over the next 85 years the KKK waged an unrelenting war of terror against blacks and white Republicans. Tuskegee Institute archives indicate that, between the years 1882 and 1951, some 3,437 blacks and 1,293 whites, nearly all Republicans, were lynched by the KKK. Is this sad chapter in U.S. history being taught in Black History classes? If not, why not? Along with the violence and the intimidation of the KKK, Democrats in southern legislatures enacted Jim Crow laws and the Black Codes… dictating where and for whom blacks could work, where they could live, where they could eat and sleep, which restrooms and drinking fountains they could use, and where they were allowed to sit in movie theaters and on trains and busses. Are black children taught the truth of Jim Crow and the Black Codes in Black History classes? Then, in 1894, after regaining control of the Congress, Democrats passed the Repeal Act of 1894, repealing much of the civil rights legislation passed by Republicans in the 28 years following the close of the Civil War. What followed was a period of some 60 years in which black civil rights were in limbo. Are these truths taught in Black History classes? It was not until the 1954 Brown v. Board of Education decision of the U.S. Supreme Court that black people could see a glimmer of hope for the rights Republicans had won for them during the previous 90 years. So is it any wonder that, 60 years after Brown v. Board of Education, many blacks still feel the indignation of slavery, the KKK, Jim Crow, and the Black Codes? In the earliest days of the civil right movement, Democrats resigned themselves to the fact that their century-old campaign to oppress blacks through violence and intimidation was at an end. Instead, they found it politically expedient to create a welfare system through which they could simply purchase the allegiance of black people… in effect, paying blacks NOT to pursue the American Dream as every other ethnic group before them had done. As a result, the welfare state has robbed black men of their pride and their dignity, and many have resigned themselves to lives of crime and anti-social behavior. 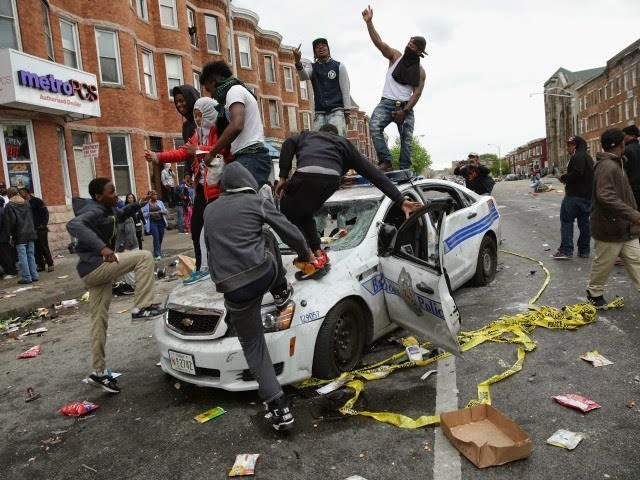 Where better to see the fruits of that cynical stratagem than in recent videos of arson and looting in Ferguson and Baltimore... what black activist Tavis Smiley predicts will be the “new norm” in race relations? But none of this would have been possible without the acquiescence of the black community. To learn how Democrats were able to implement their grand strategy we need look no further than a federal program called Aid to Families with Dependent Children (AFDC), a social welfare program passed in 1935 by a Democrat Congress and signed into law by Franklin D. Roosevelt. It was a program in which a family was eligible for benefits only if the family had at least one dependent child, under age 18, who was “deprived of financial support from one of their parents due to the parent’s death, continued absence (emphasis added), or incapacity.” In other words, if two able-bodied parents lived in the household the family was denied AFDC benefits. It’s not as if opportunity has passed black people by. If black parents, in the 50s and 60s, had insisted that their children do their homework every night; that they be in school every day; that they always behave themselves, inside and outside the classroom; and that, once they’ve entered the workforce, they always give their employers eight hours of their best effort in exchange for eight hours pay… the time-honored formula for achieving the American Dream… African-Americans would be far down the road, socially and economically, from where they are today. But blacks are not entirely to blame for the social and economic condition in which they find themselves. It is true, as liberals and Democrats insist, that black people in America are “victims,” but not in the sense that liberals and Democrats would have us believe. If black people would be honest with themselves they could readily see that every state run by Democrats is in steady economic decline, dominated by public employee unions and saddled with billions of dollars in unfunded liabilities, while every major city run by Democrats is a cesspool of crime, drug addiction, and economic stagnation. Cities and states governed by Republicans are quite the opposite, although urban blacks continue to nestle comfortably in the pocket of Democrats. Pride, dignity, and self-respect are not easily come by and the larger population, primarily white people, are not likely to forgive and forget the outrageous behavior of young black men until they’ve proven that they deserve to be treated as equals. It is they who have dug a deep hole for themselves and white people cannot dig them out of it. That is something that only they can do and it’s time they got started. But that task cannot be accomplished so long as they continue to squander their political power and influence in exchange for crumbs from the Democratic table. Does the GOP Have a Shot at the Black Vote? By Chelsi P. Henry, Esq. When our next president steps into the White House, that person should be someone who is fighting for issues that disproportionately affect Black Americans. We need someone that will make our issues a priority to discuss and solve. The three U.S. Senators on the GOP Presidential bench are youthful, accomplished, and engaged with issues affecting minorities. Whether through legislation they have passed while elected or through issue statements, rest assured these GOP candidates have and will continue to fight for Black America—they want us to have our shot at living the American dream. In the current administration, it took six years for the “My Brother’s Keeper” initative to get off the ground. Though this program has the potential to affect thousands of Black and Hispanic males, it should not have taken President Obama six years to launch. The most logical reason for my Brother's Keeper being launched in President Obama's second term is likely because of the negative perception surrounding the fact that there were no initiatives geared toward solving issues that disproportionately affect Black Americans. My Brother's Keeper is a nice gesture seeing that over 90% of Black people voted to elect and re-elect President Obama. It is time for a president to push the issues facing everyday Black Americans forward. We are an integral part of the fabric of America. When we succeed, America succeeds. The Right knows that Black votes will be critical to this election, but are they willing to fight for them? The next few months will tell. 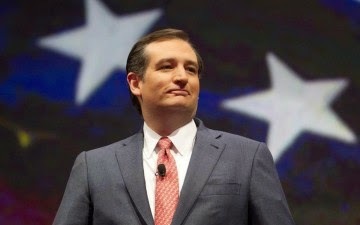 The first GOP contender to throw his hat into the race was Senator Ted Cruz (R-TX). During his presidential announcement, he opened up with faith and his family story. Since taking office in 2013, Cruz has sponsored over 30 pieces of legislation. He has proposed bills addressing free speech, foreign relations, and repealing Obamacare. Ted Cruz believes that every human life is precious, he believes a marriage is sacred and between a man and a woman, he has introduced a number of alternatives to Obamacare, and supports job creation through a vibrant free market economy. As Texas Solicitor General, he argued before the Supreme Court on behalf of Texas. Ted Cruz is conservative through and through, and his faith filters through his public service and in every area of his political ideology. The second contender to enter the race for the Republican presidential nomination was Senator Rand Paul (R-KY). Sen. Paul is an ophthalmologist who has practiced for 18 years prior to serving in the Senate. Sen. Paul administers pro bono eye surgeries when Congres is in recess. He is best known among Black leaders for his willingness to lead the charge on criminal justice reform. In 2014, he co-sponsored the “REDEEM Act”, with Senator Cory Booker from New Jersey. The REDEEM Act would allow for expungement or sealing of federal records for non-violent or juvenile offenses. The third Republican to enter the race was Senator Marco Rubio (R-FL). At 43, Rubio is the youngest contender to announce thus far. 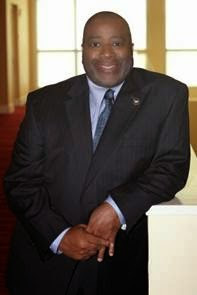 He is a former Speaker of the Florida House and got his start in politics as a City Commissioner in West Miami. He is known for easily defeating former Republican and former Governor Charlie Crist for U.S. Senate in 2010. All eyes have been on the freshman whose Cubans parents fled to America from Fidel Castro's murderous regime. Rubio has taken heat for his attempts at immigration reform. In his position on the Senate Foreign Relations Committee, Marco Rubio has been a strong supporter of the state of Israel and he has been critical of Iran's support of terrorism. He has promised to allow Americans to purchase healthcare from all 50 states. He also believes in the sanctity of life, and is fluent in Spanish. This is going to be perhaps the most diverse group of presidential candidates in history. There are governors, senators, a brain surgeon, former CEOs, and former elected officials mulling or preparing for a run. From criminal justice reformers to school choice proponents to job creators, the diversity is on the GOP's side. Let’s not wake up in 2020 and still be asking ourselves: Why are our students still reading and graduating at lower levels than their white counterparts? Why are our schools still failing? Why are young black males one in 17 times more likely to be arrested versus their white counterpart at one in 3 times? Why are so many Blacks still mired in poverty and disproportionately destitute? Political parties and candidates should earn our vote, and not receive it just because they say things that make us feel good. Their records speak volumes about their true values and their intentions for our community. Any politician or party with the stated goal of serving America should be willing to provide solutions to the needs and challenges specifically faced in Black America. The bottom line is that Black people haave options in 2016. If criminal justice reform is important to you, we have Republicans who have made that a centerpiece of their agenda. If you're concerned about your child's education or finding a well-paying job, there is a good chance there is a Republican running that is right for you. Chelsi P. Henry, Esq., is a Florida-based attorney and business consultant. You can contact her at www.chelsiphenry.com or tweet her at: @chelsiphenry. During the past two weeks Americans have lost their minds regarding the Religious Freedom Restoration Act (RFRA) that was passed and signed into law by Indiana governor, Mike Pence. My readers know I do not support homosexual marriage or the homosexual agenda of being legally protected as a class based on their sexual preferences. My purpose with this column is to bring some sanity to the debate swirling around the issue of religious freedom. I want to remove all emotion from the debate and discuss the facts. The bill in question was Indiana Senate Bill 101, titled the “Religious Freedom and Restoration Act.” Pence signed the bill into law and all hell broke loose. Opponents said the bill would allow businesses to discriminate against homosexuals; supporters said it would protect business owners from doing things that would put them at odds with their religious beliefs. The bill was three pages long and never mentioned the words homosexual or gay; thus the homosexual community went out seeking a problem where none existed. The homosexual community is masterful at PR. When you don’t have public support for your position, many times a good PR campaign can usually do the trick. As I have written many times in previous columns, Republicans are horrible when it comes to PR and communications, even when they are right on the issue. Gov. Pence in particular and Republicans in general showed total incompetence in dealing with this issue. They should have anticipated this type of reaction from the radical left. This was so obvious that even Stevie Wonder could have seen this coming. Nineteen other states have passed similar laws, with several others considering the same. So you mean to tell me that almost half of America believes in discrimination? I don’t think so! This whole debate has absolutely nothing to do with discrimination and everything to do with forcing Americans to accept the homosexual lifestyle and their intolerant agenda. Homosexuals don’t deserve special treatment because of their sexual preferences; but they do deserve equal treatment because of their humanity. They would argue how could I, as a Black man who has experienced discrimination, support the discrimination that they suffer because of their sexual preferences? Their plight, according to them, is the Civil Rights of our day. STOP right there! I find it extremely offensive for homosexuals to attempt to equate the two. Blacks fought for rights that were already enshrined in the U.S. Constitution. The Constitution granted us citizenship, equality, and the right to vote; the Constitution just wasn’t being enforced. Thus, the need for civil disobedience, political and legal action. There is no such accommodation for homosexuality, NONE. That’s what this fight is all about. They want to be “legally” codified as a protected class strictly based on their sexual preferences and gender identity. Now, let’s assume for this discussion that you are a Christian and that you believe homosexuality is a sin, thus is wrong. Homosexuals would argue, and rightfully so, sin is sin. How is homosexuality any different than lying, adultery, murder, cheating, stealing, etc.? Great question. I have an answer that homosexuals don’t want to deal with. Name me one state in the U.S. where they are trying to legalize lying, adultery, murder, cheating, or stealing? Homosexuality is the only sin that people are trying to codify as legally and morally permissible. Can someone please reconcile this for me? Homosexuals have been successful at getting many courts to recognize them as a protected class even though there is no legal basis to recognize someone based on their sexual preferences. It takes a lot of legal creativity to create a protected class out of nothing. I find it quite interesting that, as a heterosexual Black male, that I would not be allowed to join a lesbian group or sit on the board of a homosexual chamber of commerce (yes, they do exist). Is this not also hateful, bigoted, and discriminatory? Courage is stating that you are homosexual in Saudi Arabia or Pakistan. Courage is sitting at a Woolworth lunch counter and knowing that you are going to get the hell beat out of you because you are Black. On a homosexual’s worst day, they have nothing to fear in America; on their worst day, nothing they go through can ever compare to what Blacks went through from slavery until the present. We didn’t get sold into slavery because we were homosexual; homosexuals never get pulled over by police because they are homosexual; homosexuals never get shot by police because they are homosexual; they don’t get denied bank loans because they are homosexual. So please dispense with the odious comparisons. Blacks never sought special recognition as a class, we simply wanted recognition. The liberal media ignored this press release issued on September 11, 2011. Seattle. On September 11, 2011, blacks from the West Coast and the East Coast joined together and signed one of the most comprehensive legal briefs ever prepared on racial discrimination, then filed their brief today, September 12th, at 9:00 AM Pacific Daylight Time in US District Court in Seattle (Case No. C11 - 1503). The plaintiffs, who refer to the defendants as “Father of Racism,” allege that as an organization, the Democratic Party has consistently refused to apologize for the role they played in slavery and Jim Crow laws and for other subsequent racist practices from 1792 to 2011. Rev. Wayne Perryman, a former Democrat himself and the lead plaintiff in this class action lawsuit, said he was inspired to file this action after seeing the recent movie The Help. The movie takes place in the region that was exclusively controlled by Democrats for more than 150 years (the South). Mrs. Frances P. Rice, the Chair of the National Black Republican Association is also a plaintiff in the lawsuit. Mrs. Rice is a resident of Sarasota, Florida and has lived in the the South most of her life. Perryman said President Obama was named as a defendant not only because he is the official leader of the Democratic Party, but because of certain statements he made about his own party in his book, Dreams from My Father (see attachment). In 2009, the President was asked to issue an apology to blacks on behalf of his party, but he refused. Unlike other reparations lawsuits, this lawsuit merely asks for a public apology, but no monetary damages. In the 40-page brief, Rev. Perryman tells the court that the Democratic Party, (the party that is quick to call the Tea Party and Republicans racist), is the same party that refuses to confess and/or acknowledge (in public and on their website) that they are the party that supported the institution that packed millions of black men, women and children in the deep dark hulls of slave ships with just barely enough food and water to keep them alive, and forced them to lie in their own urine, feces, and vomit for the duration of a long trip across the Atlantic. And after arriving in America, it was the members of their party that forced these poor souls to work from sunup to sundown for the next 70 years and never paid them one dime. And when the black victims were fortunate enough to escape, it was the Democratic Party that passed Fugitive Slave laws to return them to their brutal slave masters. When their inhumane institution of slavery was challenged by the opposing party, Democrats countered by placing threats in their political platforms (1844-1856), - threatening anyone who dared to interfere with what they called, “the sectional issue of Domestic Slavery.” On May 21, 1856, they carried out their threats when they attacked their opposition, Senator Charles Sumner with a walking cane on the Senate floor and when they attacked with guns, freed blacks and abolitionists on the streets of Lawrence, Kansas. Six years later, Democrats called themselves 'Confederates” and went to war killing thousands to defend and protect their racist institution of slavery. After losing the war, they fought against constitutional amendments and civil rights legislation for blacks, and chose instead to form terrorist organizations, legislate Black Codes and Jim Crow Laws and support every landmark case that was designed to deny blacks their constitutional rights including the Slaughterhouse Case, Plessy v Ferguson, the Civil Rights Cases of 1881 to overturn the 1875 Civil Rights Act, and Brown v. the Board of Education. While many of these cases were pending, Democrats proudly adopted the name “The Party of White Supremacy” and committed every inhumane violent act known to mankind (from 1867 to 1977) to keep blacks in “their place.” And to add insult to injury, after killing millions of blacks through their racist institutions, they hired powerful attorneys to keep this information from blacks and to avoid apologizing to blacks. Perryman said, “Any organization that has such a racist history and receives 97% of the African American vote (after doing all they could to deny blacks the right to vote), should willingly apologize without being forced do so through a lawsuit. He said, “I guess they feel they have nothing to apologize for.” Perryman went on to say that he is “convinced that Democrats will only apologize if the media, or the courts (with public pressure) will force them to do so. The man who authored the book: The Audacity of Hope, now has the “audacity” to refuse to apologize for his political party and their racist institutions, that took the lives of millions of his own people. In the 40-page brief covering a period from 1792 to 2011, Perryman makes the following claims regarding past apologies for racism and racial injustices. Perryman said history reveals that an apology or reparation for blacks would not be an issue today had the Democratic President Andrew Johnson chosen to sign Senate Bill 60. Since Johnson’s veto of Senate Bill 60, the door for reparations involving racial injustices remained closed for over 120 years. In 1988, Congress opened that door with the passage of the Civil Liberties Act of 1988. Under that new bill, Japanese internment victims received an apology plus $20,000 each in reparation pay. In 1993, the victims of the Rosewood, Florida Massacre received an apology and reparations from the State of Florida. On May 16, 1997, President Clinton issued an apology to the victims of the Tuskegee Experiment and paid the African American victims a total of $10,000,000 in reparations. On February 7, 2005, the 109th Congress issued Senate Resolution 39 and apologized for not enacting lynching laws to protect those who were victims of lynching. In that resolution, Congress stopped short of acknowledging that all of the lynchings took place in regions controlled by Democrats. And finally on January 20, 2007, the Executive Committee of the Democratic Party of North Carolina apologized for the 1898 riot and massacre that killed several black Republicans and drove them out of office. See attached copy of the brief. Rev. Perryman is the same Seattle minister who used his biblical research in 1994 to persuaded the world's two largest Christian publishers and the Encyclopedia Britannica to apologize and remove the “Curse of Ham” theory from all of their publications. The curse theory had existed for over 500 years and was used by Southern Christians and Democrats to justify slavery and their mistreatment of blacks. To Read a copy of Rev. Perryman’s entire legal brief, CLICK Here.